Before the Taliban came into power, Rukhsana attended university, played cricket, fell in love, and even became a journalist. But now she is just one of the faceless, voiceless single women of Kabul, unable to leave her home alone, condemned to invisibility under her burka, hoping to find a way out of Afghanistan for both herself and her younger brother, Jahan. "A few meters of fabric, soft, fragile, and pliable, became our cell. No granite was was more impregnable, no bars more unbreakable, no dungeon darker or more dreadful. I vanished from sight, as if a magician had passed a wand over me. I was no longer Rukhsana with a distinctive nose, a mouth, eyes, a forehead, a chin, a head of hair, but a walking shroud, identical to every other shamed and shrouded woman in the street. Under the burka it was clear that this Afghanistan had no place for women." Wow. I loved this book! Timeri N. Murari's writing is poetic and powerful. I held my breath with Rukhsana, and cringed in fear, and laughed and cried with her. I worried about her brother and her cousins. Murari even made me care about a cricket match. 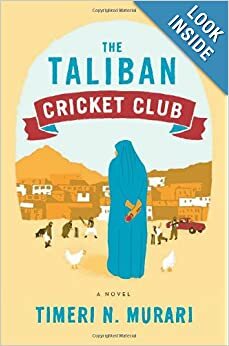 The Taliban Cricket Club is a remarkable story of one young woman's hope, strength, and defiance in the face of overwhelming cruelty and terror. It is a story of family loyalty. Most of all, it is a love story. One I won't soon forget. Everyone has their own bookish preferences when it comes to organizing and arranging their books. Some are strict alphabetists--bibliophiles who arrange all their books in alphabetical order by the author's last name, no exceptions, and who wouldn't dream of doing it any other way. Then there are the Dewey Decimalphiles--library lovers who like to order their own books according to subject matter and the random numberization of the Dewey Decimal system. Then there are the random stackers and plastic tote packers--those book lovers who keep their books in piles and stacks (and in boxes and totes), in no particular order, all over the house. On nightstands. On stairs. Even under the bed. 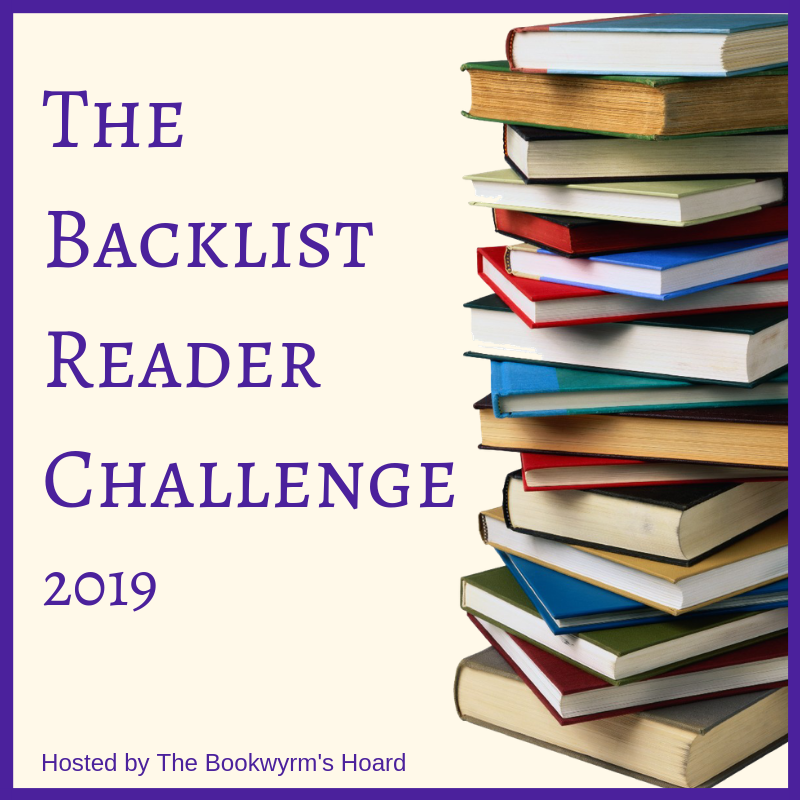 There's always room for more books with this particular system, but finding what you want to read when you want to read it can be a challenge. As for me, my system's a bit of an eclectic mix. I like to separate my non-fiction from my fiction and I like to group certain genres together. For example, all my classics reside on their own shelf, as do my children's books. But because of space limitations, a lot of my other books have to mingle together, in mostly alphabetical order, on my remaining shelves. It's not a perfect system, and I'm sure others would find it a bit random and confusing, but as long as I know where all my books live that's all that really matters. Right? What about you? How do you organize your books? What makes you choose the books you read? For me, it depends on the book and the day. 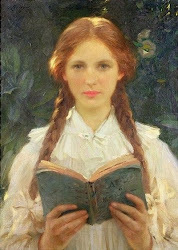 Sometimes I choose a book because I like the cover, title, or author, or because of a good review or enthusiastic recommendation. Sometimes it's because of the setting (a haunted house, a bookstore, Paris, Scotland, coastal Maine, the Amazon Jungle), or the time period (the Gilded Age, the 1920s, a dystopian future). Sometimes it's because of who the main character is: suffragette, college student, ballerina, archaeologist. And sometimes it's just because I'm in the mood for a particular kind of book: psychological thriller, ghost story, romance, survival/disaster, mystery. I'm not fussy. I don't even care if a book is a classic, best-seller, young adult or middle grade fiction; to me, a good book is a good book. (Although there are some books I automatically avoid--like erotica, or anything to do with Napolean or ancient Rome.) I guess that makes me an eclectic reader. Are you an eclectic reader, too? What puts you in the mood to read? It's Paris in the late 1880s. The Second Empire has fallen. The Eiffel Tower is under construction. And Maude Pichon, a 16-year-old runaway, has come to Paris dreaming of a better life. She ends up as a "repoussoir" instead: a plain girl hired to be a foil to Countess Dubern's prettier daughter, Isabelle, for the season. It's the rage among the rich of Parisian society--this hiring of ugly women to act as companions at society events in order to look more lovely by comparison. And, unhappily, Maude fits that bill. "Sometimes, when I feel strong, I don't mind being ignored ... but other times I feel wretched. The problem with being a professional wallflower is that you have time to reflect on your own inadequacies, you're constantly reminded of your undesirable status. Just once I'd like a chance to shine." I didn't expect to love this book as much as I did. And it's not just because it's set in Paris. I really liked the characters. Maude and Isabelle are a study in contrasts. Isabelle is beautiful and rich; Maude is plain and poor. Isabelle dreams of escaping society, attending the Sorbonne, and studying science; Maude dreams of someday belonging to Isabelle's world. Then there's Isabelle's mother, the Countess, who wants her daughter to marry well, and who expects Maude to help her achieve that goal. As a repoussoir, Maude finds herself torn between her job and the Countess's demands, and her growing friendship with Isabelle. I really sympathized with Maude. She's young, and naive, and doing her best to find her way in a very unsympathetic world. "My role in all this has been to try to please both parties, leading the life of a double agent, keeping secrets from both mother and daughter ... It's exhausting, but I've become used to contorting myself into what people want me to be." Elizabeth Ross drew inspiration for her novel from the short story "Les Repoussoirs" by Emile Zola, and she does a masterful job. 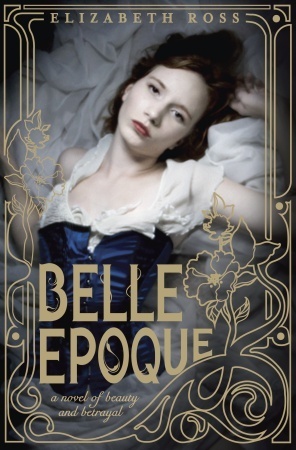 Belle Epoque definitely lives up to its name--this is a beautifully told story of friendship, and beauty, and truth. ...Clare remarked, thoughtfully, "You know, 'Rene, I've often wondered why more coloured girls, girls like you and--oh, lots of others--never 'passed'over. It's such a frightfully easy thing to do. If one's the type, all that's needed is a little nerve." 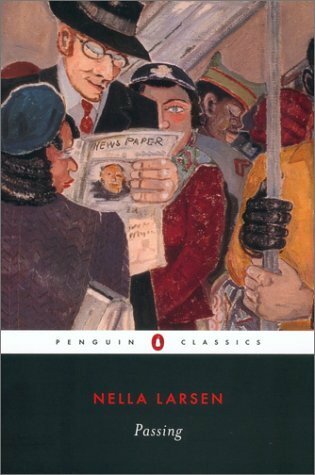 Set in Chicago and New York in the 1920s, Nella Larsen's novel, Passing, is a series of collisions between two women: Irene Redfield and Clare Kendry. Clare has been 'passing' as white since she was 18; Irene, who stayed with her own race, finds the idea of 'passing' both "dangerous and abhorrent". And every time Clare resurfaces, so does Irene's fear, anger, and resentment. 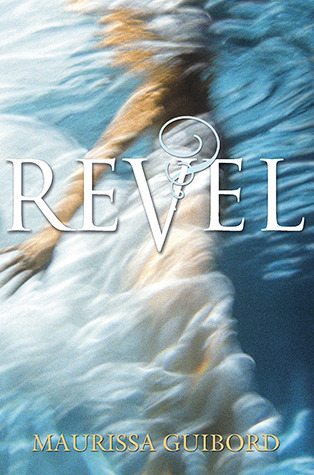 Irene desires safety above all else, while Clare's whole life has been about risk. Clare goes after what she wants no matter who it may hurt. Her selfishness threatens Irene's home and happiness. Yet Irene finds herself unwilling to betray Clare's secret. (Irene) said: "It's funny about 'passing'. We disapprove of it and at the same time condone it. It excites our contempt and yet we rather admire it. We shy away from it with an odd kind of revulsion, but we protect it." It's this odd tug-of-war that creates the tension between Clare and Irene. Both women married very different men and live in very different worlds, but who chose the better life? Who's right? At first glance, it would seem that Irene made the "right" choice, but life is not so black and white. Passing is more complicated than that. It's the contrast between Clare and Irene, and the final collision of their two worlds, that makes this novel so interesting and thought-provoking. Nella Larsen is an amazing writer. I'm so glad I read this classic novel; I'm just sad she only wrote one other. I miss bookstores. At one point, I lived close to six bookstores: Little Professor, Sam Wellers, Deseret Book, B. Dalton's, A Woman's Place Bookstore, and Walden Books. It was great. Then a few of those stores went out of business, but Borders and Barnes and Noble took their place. Still great. And now? Only two are left: Deseret Book and Barnes and Noble. And Deseret Book sells more games, CDs, DVDs, and other gift items than books. It's disheartening. And while I like Barnes and Noble, it's not the bookstore it once was. And that makes me sad. Down Fell the Doves by Amanda Shires is an amazing CD. Soulful and haunting. I've been listening to it all week. Library day ... and once again I checked out more books than I can possibly read in three weeks. I just can't seem to help myself. Books are my weakness. Speaking of the library, they just installed a new operating system at ours, and the new search engine is less than stellar. I typed in an author's name--Oliphant, Margaret--and it asked me if I meant "elephant margaritas". Really? If you haven't seen the movie The Monuments Men yet, go! The acting...the art...the story...it's definitely the must-see, don't-miss movie of 2014!!! "The girl was very pretty, though she had red hair." 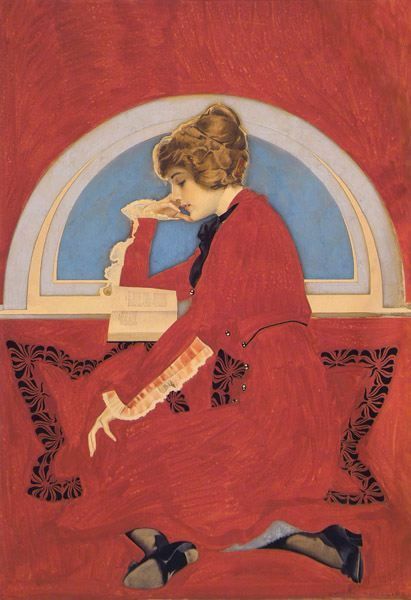 check out A Bookish Valentine. Setting: A private island off the coast of Maine where visitors aren't welcome, unnatural mists roll in unexpectedly from the sea, and where, once there, you might not be allowed to leave. First Line: Maybe I should have known from the beginning to stay away from Trespass Island. My Thoughts: I've always wanted to live on an island, but I don't think I'd want to live on Trespass. Delia McGovern's mother, Helen, escaped the island when she was 16, but now Helen is dead, and Delia, just 17 herself, heads to Trespass with her mother's ashes, hoping to meet her grandmother and find some answers to her mother's mysterious past. What she discovers is much more magical and strange: demigods straight out of a Greek myth, sea monsters, portents and rituals, an impossible love ... and danger, especially for someone like Delia who doesn't understand the island's rules. Can she survive the island? Or will she be forever changed? "I was growing to love the sea. Every morning the tide made a new beach, washing away whatever had been there before and leaving new treasures. And the water was never the same color twice. Some days the waves were rich indigo blue, sparkling with winks of sunlight; on others, a bleak gray as cold and heartless as stone." See what I mean? If you're looking for a fun beach read with a bit of romance, myth, and magic, give this book a try. It won't disappoint. 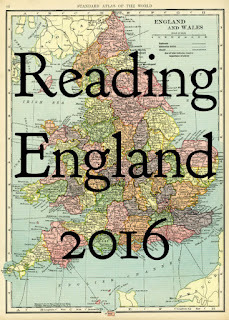 Wanna play some reading Bingo with the books you read this year? Check it out... Random House has Printable Bingo Cards (with a different Bingo card available for YA readers). Read a book and fill in a square. What could be easier? Or more fun? Isn't this idea great? I love it so much I've decided going for a simple Bingo isn't enough...I'm going for blackout. After all, there are only 24 squares to fill out (48 if you play YA Bingo, too), and I've got all year. (I've already filled in 5 of the easier squares.) There are a few categories that worry me though, like having to read a book of short stories, or a book with non-human characters. Those will definitely be a challenge. Got any suggestions? As for the rest, they should be fairly easy to complete. 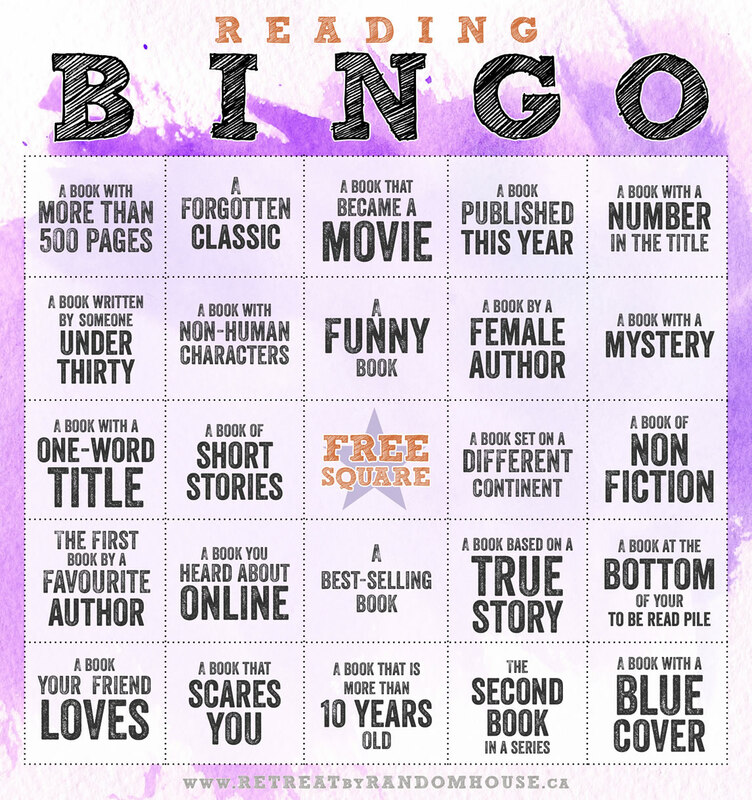 So print out a card and play some bookish bingo this year, too! Need another reason to read this book? FIRST, it's really funny. 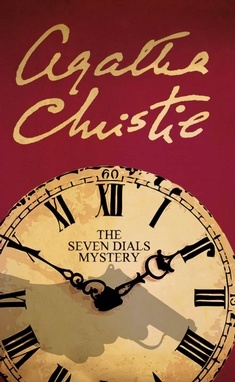 Christie's wit and humor shine throughout--she pokes fun at the English aristocracy, and the things her characters say and do made me laugh out loud more than one. SECOND, the characters themselves are likeable, memorable, and never dull. Especially Bundle Brent. (Isn't that the best name?) "Bundle Brent was a resourceful girl--she was also a girl of imagination." She's not one of those annoyingly stupid heroines; she has nerve and daring. "You never know what mad thing she won't be up to next. She's so frightfully unexpected. And the worst of it is, she's so astonishingly successful. I tell you, keeping Bundle out of mischief is a whole-time job." And the THIRD reason to read this book is Christie herself, specifically her masterful misdirection. Just when you think you've figured things out and solved the mystery, Christie yanks the rug out from under your feet. Talk about superior sleight-of-hand! That's what makes her novels, with their complicated plots, so much fun. One of her characters gives some good advice, and I second it: If you do choose to read this book... "SUSPECT EVERYONE!" 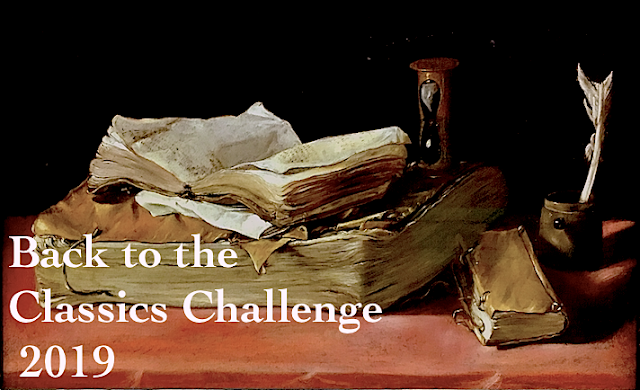 What's in a Name 2014 Reading Challenge Update: 1 book read; 4 more to go. 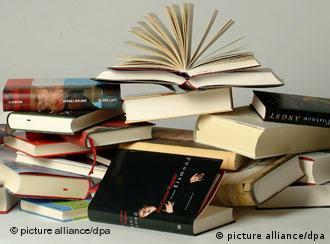 Category Completed: Read a book with a title that has a number written in letters in it. "Mr. Reardon," said Francisco, his voice solemnly calm, "if you saw Atlas, the giant who holds the world on his shoulders, if you saw that he stood, blood running down his chest, his knees buckling, his arms trembling but still trying to hold the world aloft with the last of his strength, and the greater his effort the heavier the world bore down on his shoulders--what would you tell him to do?" "I ... don't know. What ... could he do? What would you tell him?"